Back in January we posted an analysis of the current bear market in terms of the historic length and drop in the S&P 500. The technical analysis was done in October by Renaissance S&P Research. We thought it would be interesting to take a look at this five months, and many percentage points, down the road. The recession was a year old at that point (young by average recession standards) but the market had already fallen 42% (a larger drop than the average recession). At seventeen months, we still have not reached the average length of a recession since the Great Depression. 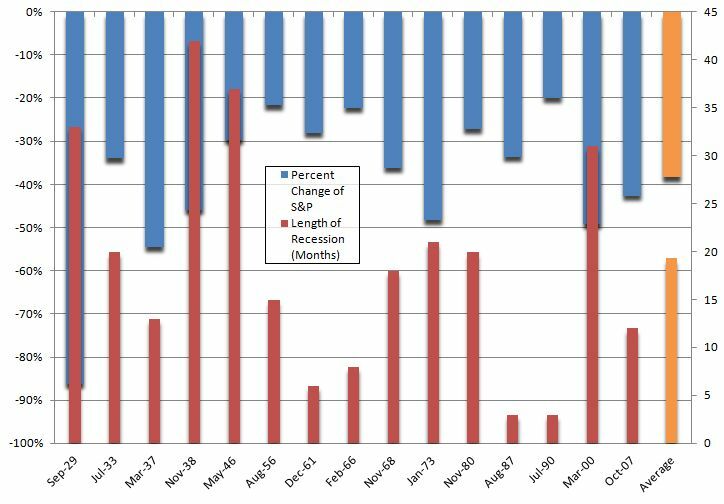 In fact, 8 of 14 recessions have lasted longer than this one has so far. So by historical context, we're still getting started. That makes the next observation even more depressing. In terms of percentage loss in the S&P 500, we are now in the midst of the largest loss since the Great Depression. We've now lost 56% since the high of 1,565 on October 9, 2007. Ouch. It seems ever more clear that the world has changed and that the days of prosperity as we knew it are not about to return any time soon. While these trends may reverse, it is unlikely that we - as Americans, consumers and voters - will go back to our old ways unchanged. We're different, and I think it presents a challenge and an opportunity for planners of small-towns to have discussions that perhaps in another time would have been simply alarmist. Glass half full: We're closer to the end than we once were. Glass half empty: We still have a long ways we can fall. Let's hope these trends reverse soon so the leaders of our small-towns can start to come to grips with the reality of this new world.